The DVD (which stands for “Digital Versatile Disk”), was invented by the major electronics companies in the 1990s: Sony, Philips, Toshiba, and Panasonic. DVDs are a good way to backup data permanently. DVDs are a more stable medium for backing up and carrying around information than a USB flash drive. If you want just one copy, then an internal or external DVD burner will be sufficient. But what if you want many copies of the same DVD? 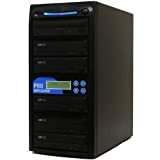 If you're into copying music or home video, and you have to make a lot of copies at once, you'll find a DVD duplicator handy. 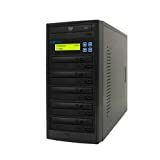 There are also more serious DVD duplicators for office use. And there are still things to learn about how to achieve the best results. Here is a guide to some of the DVD burners on the market. 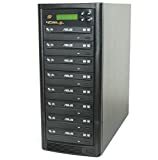 Standalone DVD Duplicators: These are DVD burners that can copy from one source DVD to several DVDs at once. They are standalone units, in that they don't have to be installed in a computer to copy. There are burners that can make as many as 11 copies at once. You'll need a master DVD, from which to make copies. The Copystars DVD duplicator is such a unit. It can burn 7 DVDs (or CDs) at a time, but only if you supply a master DVD first. Duplicators that hook up to a computer/tablet/network: There are duplicator units that also have a USB port to connect to a personal computer. That way, you can take data from your computer and simultaneously make several copies. Use Quality DVD-r discs: If you're using your DVD duplicator for backing up material, you clearly want the writable DVDs to be of good quality. Even though such discs will be more expensive, you can expect the recording to be more stable with time. Duplicates CDs as well: A DVD duplicator will copy CDs as well. 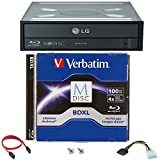 But it will not work on Blu-Ray discs (they are burned with a different frequency of laser light than a DVD)—for that, you will need a Blu-Ray burner. Replace Failing Drives: If you notice that some of the burners stop producing copies, the company can typically offer replacement drives. Types of DVD formats: You'll see a wide variety of DVD formats, and you have to make sure that the duplicator can copy the format of the master disc. For example, you'll see DVD+R and DVD-R. They both stand for “Digital Versatile Disc Recordable”. The “R” means that you can record data to a DVD. (The “+R” and “-R” can both be read by DVD drives—the only distinction is the type of electronics and the method used to affix the data on the DVD disk.) Once the information has been recorded, it can't be erased and reused. (It can be overwritten, however.) You'll also see “DVD-RW”, which are rewritable disks—even after you have burned information to the DVD, it can be erased and replaced with other data. Dual layer/double-sided: You will also see DVD-R disks that are DVD-R DL (dual layer) or DVD-R DS (double-sided). This means that the DVD burner can write to both sides, or on two layers, of the disk. The capacity of the DVD will go from 4.7 Gigabytes to 8.5 Gigabytes or 9.4 Gigabytes (the capacity also depends on the number of data sectors that have been arranged on the disk—the 8.5 GB disk has fewer data sectors than the 9.4 GB disk.). This is especially useful when recording long movies. Burning speeds: You'll see DVD burners that say “24x”. That's read “24 times”. You may ask: “24 times what?” That is the maximal speed at which the DVD burner transfers data to the disc. If the DVD burner transfers data at 1350 Kilobytes per second, your DVD then writes at a maximal speed of 24 x 1350 KB/s =32.4 Megabytes/second. That will copy a 4.7 GB DVD in 145 seconds, or about 2.5 minutes. It's recommended to burn at slower speeds—the copy will be a more accurate copy of the original, with fewer chances for errors. Interface to tell you how many burns succeeded: Most duplicators will give statistics of how many discs were burned successfully, and how many failed. For example, the Produplicator 1 to 5 24X duplicator will eject the discs that copied properly, while the ones that didn't copy properly need to be ejected manually. Lightscribe Duplicator: One feature that is useful is the Lightscribe Duplicator, as produced by Copystar. Lightscribe prints pictures and text on the disc after you finalize the duplication. It labels the discs permanently with laser etching—it sure beats having to attach stickers to all those copies that your just produced. Best Duplicator—are leaders in duplication systems. 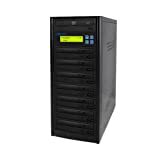 They make duplication systems for CDs, DVDs and BluRay, as well as for fiber optic data networks, Firewire, USB2, and hard drives. The company was acquired by Amamax in 2012. ProDuplicator—was established in 1997 in Los Angeles, California. They started with sales of portable storage devices, like optical disc burners and hard drives. They expanded to duplication equipment and media publication. They also duplicate flash memory cards, hard drives, Blu-Ray discs, and more. Acumen Disc—are makers of duplicators, controllers, optical drives, and 3D printers. They were established in 1995 in Somerset, New Jersey. Their equipment is used for computer, video, audio, photography, entertainment, and multimedia. Copystars—are makers of standalone optical drive duplicators. They have been designing and manufacturing BluRay and DVD duplicators since 2004. They make duplicators for USB flash drives and memory cards as well.